Gade photo saa... Trou-du-Nord Haiti - Frè Jovenel Moise ak Sè Martine ale legliz... Ki valè kob yo bay nan ofrann lan la a... LOL...10 goud? 100 goud? mil goud? 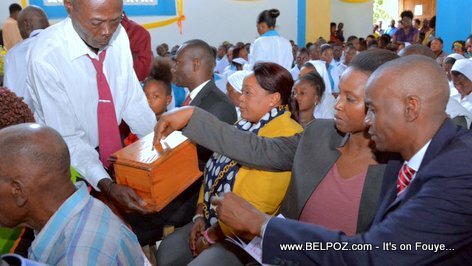 Look at this photo... Haitian candidate for president Jovenel Moise and his wife Martine in church tithing... What do you think about that? Jovenel Moise poste sou kont Twitter li: "Nan Otwou pou'm selebre Fèt Sen Jan Batis ak moun peyi'm. Bòn fèt tout moun k'ap fete nan kat kwen peyi a."